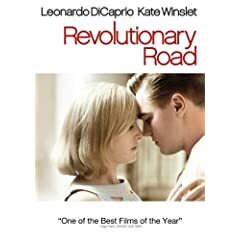 HOLLYWOOD, Calif. – “Leonardo DiCaprio and Kate Winslet are brilliant” (Peter Travers, Rolling Stone) in the mesmerizing epic Revolutionary Road, arriving on DVD and Blu-ray June 2, 2009 from Paramount Home Entertainment. Nominated for three Academy Awards® and four Golden Globes®, the emotionally gripping film has been called “amazing” (Peter Travers, Rolling Stone), “flawless” (Rex Reed, New York Observer) and a “masterpiece” (Mick LaSalle, San Francisco Chronicle). Directed by Oscar® winner Sam Mendes (American Beauty) and adapted from the groundbreaking novel by Richard Yates, Revolutionary Road won Kate Winslet her first Golden Globe for Best Performance by an Actress in a Motion Picture – Drama. Reuniting DiCaprio and Winslet for the first time on screen since Titanic, the incisive portrait of a 1950s American marriage unfolds as an enthralling drama that is moving, thought-provoking and “a revelation” (Clay Smith, “The Insider”). below. Last date for entries is June 3, 2009.